This card is totally fabulous! So pretty! Love how these cards coordinate! Amazing cards and a great release!!! Great cards Joan. I especially love the 1st one. Its totally fabulous! I love your first card, it totally pops! Lovely cards both. I love the way you used the popup totally on the card! The butterflies are beautiful too! Fabulous cards, Joan! (yes, I'm being a bit repetitive here). Love the butterflies and the sentiments. Great cards. I love your creativity. Thanks for sharing. Absolutely beautiful cards!Thanks for the inspiration! What fun cards you made! Love the colorful butterflies!! great sentiment stamps. Thanks for the cards! Beautiful cards! LOVE the ton of butterflies! Gorgeous! Fun colors! I love the pile of butterflies!! What a gorgeous ombre background and that fun pile of butterflies reminds me of the migrating monarchs in Mexico! Just beautiful............great new releases. Stunning composition! Wonderful cards! I especially love the butterflies! Love your cards! the butterflies are fab!! Both cards are so bright and colorful. Love the background on the first. I love the dimension of both of your cards. The butterflies are literally flying off the page and the "totally" of course is 3D... I have to get more of those die cut words! Thanks for sharing your creativity with us. Wow, that butterfly card is amazing! These cards are so inspirational! Your card is totally fabulous ! a dozen or so of butterflies is so much fun! Just love your combination of distress stains in the first card. Both cards are lovely. WOW! Both of these cards left my jaw on the floor. Gorgeous. Beautiful cards! Love the warm red you chose for your creations! Beautiful cards. Love the use of the distress stains. Both cards are gorgeous and I do love those butterflies! Lovely cards. I like the colors orange and gold very much. I LIKE! YOU are fabulous! Awesome cards! Thanks for sharing. I like them both--very different. Awesome cards and new release! Lovin' it! Great colors,great card.I'd be thrilled to win some goodies! You had me at BUTTERFLIES! Love that card. But thinking I need to get ahold of some of the "special sauce" spray! Fabulous background and love your little pile of butterflies. Looks like this release is another winner. What beautiful cards! Lots of great ideas. Love your cards!! 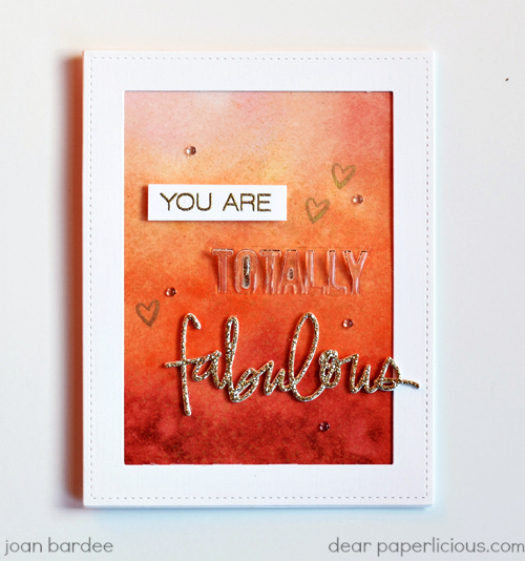 YOU are Totally Fabulous! I love those the bold butterflies! Beautiful cards! beautiful set of cards... especially like the second one! the cluster of butterflies is stunning! Such vibrant colors - beautifully done! Your cards are amazing and so is this release. Thanks for sharing. Nice cards, and fabulous bunch of beautiful butterflies ! OMG -- this is so unique! Love the bunch of butterflies under the vellum. I need to try that! What a gorgeous watercolor background!!! Gorgeous cards! Love the cluster of butterflies! Thank you! FAN-STAMP-MAGORICAL!!! I adore these, Joan--man, oh man--do I adore! XOXO!!! Ooo, you’re new to me. I love your cards and this new EH release. Wow! I love the butterfly card- such great & vibrant colors! Beautiful cards! I wish my handwriting looked that that "fabulous" die! Love it! Love your fun, bright and happy cards! I love both of your cards, Joan! Fun, fun, fun!!! Love your FABULOUS cards. Can you guess which die set is TOTALLY on my must have list?! Your butterfly card is cardmaking perfection. I love everything about it, from the layout to the black outlines and your coloring. Beautiful cards. The colors are wonderful. Really love the flock of butterflies. Gorgeous cards! That pile of butterflies is just so wonderful! Terrific cards! Love the font of the sentiments! These cards are what is/are totally fabulous! 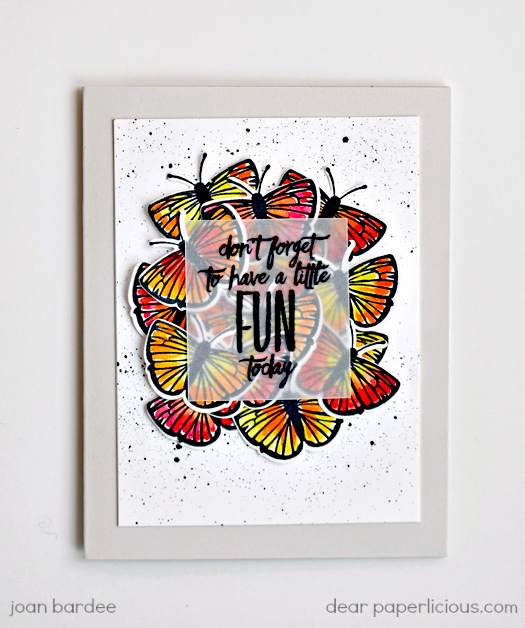 Great cards - love the bright and happy butterflies. This release is awesome. Your cards are SO awesome, Joan!! Your cards are fantastic and totally enabling!!!! I had to buy the die set and stamp set!!! Both cards sent my creative juices flowing! Thank you for the inspiration and lovely work!! The butterfly card is so awesome! Both cards are really wonderful, but that pile of butterflies...well, it is totally fabulous! Wow your cards are awesome!! Now I can't wait to use my Totally Fabulous die!!! Thanks for the inspiration! These cards are totally awesome! Bright & fun! Love the new release. Thanks! Lovely cards. I'm getting so many great ideas on the hop. Your cards are lovely! That distressed background with the gold in the top card is amazing! Love the sparkly "fabulous" and the colorful butterflies. Love them both! The coloring is so much fun, and I really like the sentiments. Just right for encouraging someone. Thank you. Fabulous butterflies! wonderful, stunning colors. 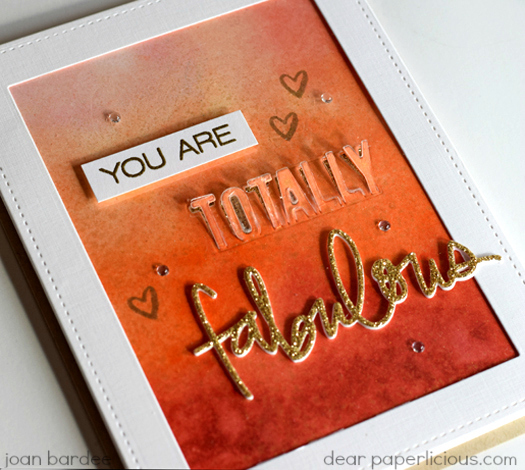 Your cards are "totally fabulous". These are beautiful, Joan! I especially love your butterfly card! Lovely pile up of butterflies. Those butterflys are so pretty. Love the shape of them. Amazing! I love the ombre colors and the little dash of gold. So pretty! The butterfly card just makes your smile, so happy! Love your background on the other card as well. Joan - this is totally fabulous!! The orange makes me happy and I love the butterflies radiating out from the center on your second card. Great card, Love the popped up Totally Sentiment in the card..
beautiful colors and those butterflies are fantastic! Love your use of colours on these cheery cards! Gorgeous cards! Love the background on the "fabulous" card. Love the sentiment on the butterfly card. I just LOVE the butterflies!!! Great cards! Love the handwritten sentiments - so fun! Fabulous cards! LOVE the butterflies, such a great design! Fabulous... The butterflies are so wonderfully colorful! Lovely cards, Joan. I especially like the distress inked background. Love this, especially that touch of gold glitter! I am really loving your flock of butterflies! Fun cards. This is a fabulous release. Love how you put all the butterflies together. Love the way you've framed the first and those butterflies...WOW!! I love your color selections. Love how you've focused on the sentiments! Really draws the eyes in! Can I say fabulous...... love the stack butterfly cards. Both beautiful and happy cards! Love all those butterflies, helps keep the February winter blues away! Totally fabulous!! Love the warm colors and the terrific butterflies! Gorgeous cards! Love your colors! Those butterflies are scrumptious! Love the butterfly pile card! you should be happy with these cards - both are totally awesome!! The colors you used are fabulous. I love butterflies and you have made 2 great cards. I love how you used the "totally" die. It is so fun popped up like that. I especially like your card with the beautiful herd (?) of butterflies on it--it's absolutely gorgeous! Love the word fabulous, especially in gold. Love these cards. After viewing mood; happy! WOWZA. Love both of your cards Joan...the Totally Fabulous is Totally fun and the Up The Happy?! AMAZING. Lovely, lovely sketchy flowers. Gorgeous backgrounds too! Beautiful cards. What a great idea to spray with gold. Can't wait to try it...the color is beautiful!! That gold spray is gorgeous. I love the "totally" die--what a neat effect it makes on your card. Stunning cards! I really love the stacked butterflies & their awesome colors! Love how the butterflies are so colorful and vivid! Thanks for linking to that gold spray, I must try it!! Gorgeous cards! I love the gold glittery fabulous die cut. So pretty! Those bright and colorful butterflies are eye-catching and impactful. Wow! Beautiful! I really like both cards. The orange/rust hombre effect is exceptional. Fabulous cards, love those colorful butterflies! Amazing cards!! I just loved your combination of the background in the first card - it looks so delicious - just perfect to show off the gold sentiment! And the second one - butterflies - no need to say anything else!! Fabulous cards, Joan! Love them both. Wonderful!!! LOVE that ORANGE and the Butterfly Cluster!!! Such beautiful work! I love this new release and can't wait to get a hold of those butterflies. What a fabulous blog hop. Love your pile of butterflies behind the sentiment!! Love your cards Joan! Those butterflies are the bomb!! Totally in love with the butterfly card. It is so bright and cheerful. Reminds me of a garden! Gorgeous cards. Love the colors and cards' design. Now that's a cluster alright! Fab. Love the butterfly card. Can't wait to get my hands on some of things in this release. Thanks for the opportunity to win. Wow, your cards are stunning!! Love the vibrant burnt orange color on your first card. It completely zings!!! Love the way that you stacked up the buttrflies! It does look just like chocolate! Love the color choice! Those butterflies look so lifelike, love! L:ove your amazingly rich colors and unique layouts! I need to visit here more often. Especially love the group of butterfly beauties. Thanks for the sweet inspiration. WOW!!! Great cards, Joan. Retirement agrees with you!